I came into WordPress like a lot of people: I wanted a blog. I tried blogspot and it was lacking, so I googled around and discovered WordPress. This was 2007, WordPress 2.2 had just been released. Widgets were the hot new thing. Tags were still a few months away from being added to core. It was an entirely different WordPress than we have today. WordPress has had a giant impact on my every facet of my life since then. In just the last week, I organized a last minute Happy Hour for a friend I made because of WordPress. I sat at the house of a friend enjoying the company of him and his family because I got involved with WordPress. I started a job I got because I got involved in WordPress. I took a friend out for a drink who I met because of WordPress. I wore a bow tie that was given to me with a WordPress logo because I got involved in WordPress. I stayed up entirely too late making Art to celebrate WordPress because I got involved in WordPress. 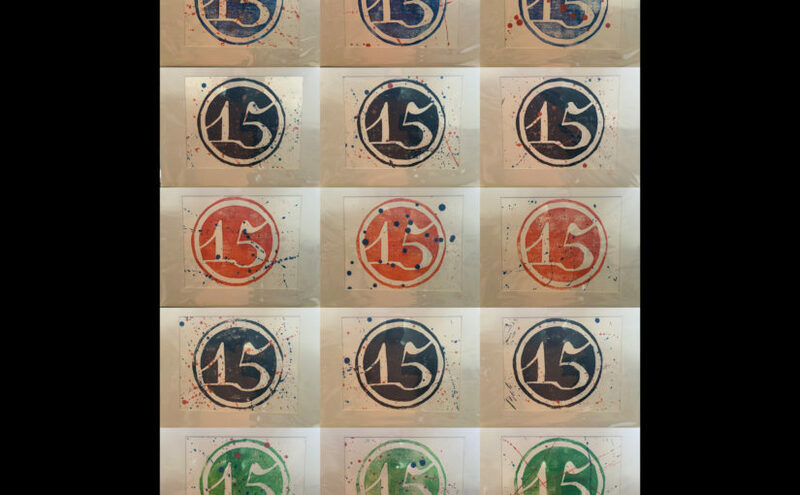 Above you’ll find 15 mono prints I made in celebration of WordPress’s 15th anniversary. Inspired by the WordPress logo, I based the text on Dalliance, Jason Santa Maria’s inspiration for the original W, before cutting the linoleum and making each print. For the Blue, Black, Orange, and Grey, I used printmaking ink. The green is acrylic paint. I then splatter painted till I was happy with the effect. Each print is hand numbered and signed on both the mat and the back of the print. Over the coming weeks, I’m hoping to send a few of these off to some of the people who have influenced me the most in the WordPress community. I also think I’ll throw one or two on ebay to raise some money for charity. Comment below if you want me to update you when I do so. I continue to remain optimistic about the long term success of WordPress. I’m writing this in Gutenberg, where I’ve written almost all my posts over the last year. Five years ago I went to JSConf and the reaction of many people towards hearing I worked on WordPress was that it was amateur. This last week I went to a CSS meetup and the reaction to people hearing I worked on WordPress was respect. Always bet long on WordPress. I previously blogged WordPress’s 10th anniversary and hope to blog it’s 20th as well. I’ll drive up the eBay prices, count me in regardless of the charity you choose. Also, happy Memorial Day weekend!